quiet time | Living "after the manner of happiness"
It was the summer of 1984 and I was 16 years old. My sister was the Girls Camp Director at Camp William Penn, a camp in the Pocono mountains for underprivileged children from Philadelphia. One of her counselors needed to leave abruptly before the last 2-week session of camp and I was asked to fill in. A few days after my arrival, our 9- and 10-year-old group went on an overnighter which consisted of walking about a half a mile around the lake, heading into the woods, and camping in tents for the night instead of in the regular cabins. When we had almost arrived at our camp site, the head counselor of my unit asked me to return to the main camp for the forgotten left-handed smoke shifter. Now, I’ve never been accused of being the sharpest tool in the shed and, remember, I was 16 and the new kid. So I dutifully headed back to camp to retrieve the left-handed smoke shifter from the nurse who’d reportedly had it last. Surprisingly, she didn’t have the left-handed smoke shifter, so she sent me to the Activities Director who sent me to my sister (Benedict Arnold) who sent me to the Head Cook, who finally took pity on me and told me that there was no such thing as a left-handed smoke shifter. Well, I went to my cabin, laid down on my bunk, and pouted for a while; then returned to the camp site and took my revenge. But that is a story for another day…. So I ask you: What are the left-handed smoke shifters of our day? What are the views the world presents to us as fact and truth, which simply are not? Tonight I’d like to address one left-handed smoke shifter that I feel we sometimes struggle with as parents in Highland, Utah. It’s the lie that our children need to be good at everything or the best at something; that our main job is to keep them busy, whatever the cost; and that being at home is somehow second best. (So I guess that’s actually three lies!) I think buying into these lies stems from the harmful practice of comparison and the sin of pride—both of which I’m sad to say, I know about first hand! I know that all families are different. All children are different. Only you can know (with the help of the Holy Ghost) the best way to avoid the worldly lies that you might struggle with. But may I suggest six things we did in the Juchau home to combat those dreaded left-handed smoke shifters. And if you’re tempted to leave feeling depressed or inadequate; please don’t. These are just ideas that you’ll hopefully consider. How about the time when our daughter Sarah stepped in a hole while playing night games and came home with a swollen toe and a big cut on the bottom of her foot. We looked at it, pronounced her fine, told her to “walk it off” and sent her to Girls State in Cedar City the next day. When she came home a few days later and we finally took her to the doctor (because her foot was oozing, bruised, and still swollen) we found that she had a broken toe and an infection in the cut. Or the time our daughter Anne left on her mission and Chris and I both sent our emails to her old email account so she didn’t receive an email from either of her parents her first week. Or the literally hundreds of times I’ve called one of our kids by the wrong name (mostly I got them mixed up with each other, but sometimes I called them Otis, who is the dog). Or the times we disciplined out of anger. Or the times I was impatient when one of our normally quiet kids felt like talking—usually around 11:00 at night. 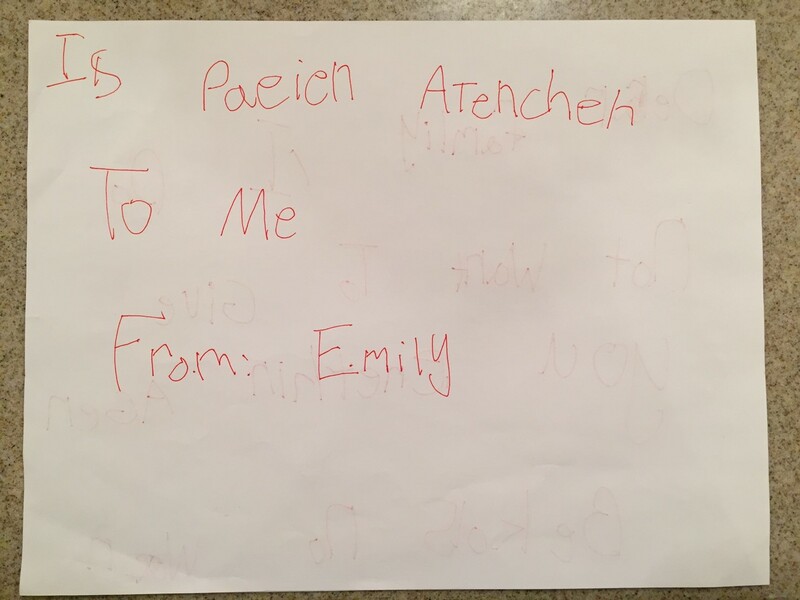 Here’s a note our daughter wrote to us when she was in first grade (she was very precocious). 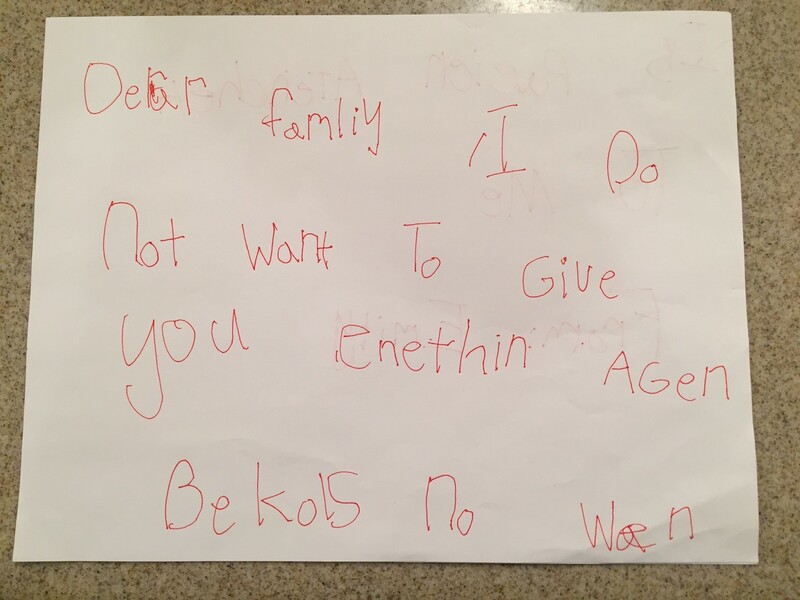 I don’t know what’s more pathetic: the content of this note or that I think it’s kind of funny. Here’s another note (from Anne; with each letter glued onto the page separately, serial killer style). We aren’t the perfect parents. We don’t have perfect children. We didn’t do the following six things perfectly. But we tried to do them (then tried again when we failed) and I think they were all important. Every day before our kids went to school, and also in the summers when they were school age, our family spent one hour a day having quiet time. This was time to nap (for young children) or to quietly play by themselves or to read. Through this practice, our kids learned how to amuse themselves, they learned to be creative, and they learned to recognize that they could be quiet for a little part of each day. It wasn’t a punishment because we started it way before they knew normal people didn’t do it and we were consistent. The world today has so little peace. Children need to learn how to be reflective and how to be by themselves (and not have to be entertained by electronics!). I found that we even got along better after an hour apart each day. And maybe children have a greater capacity for reverence at church when they spend some regular time being quiet at home. I recognize that most of us are past the stage of very young children and an official “quiet time” isn’t an option, but I hope you’ll recognize the need for older children to have time to be quiet, too. At the Mt Timpanogos baptistry they encourage all patrons to spend a few moments in the quiet chapel even if the font is empty when they arrive. The temple presidency believes that our youth need time to sit quietly, read the scriptures, and think. I agree. Prophets have been counseling us to have Family Home Evening since 1951—that’s longer than most of us have been alive! It’s hard, I get it! If it was easy, we’d all be perfect at it and we’re not. My husband is an organized fellow. This is how he handled family home evening assignments for many years. Every Sunday night this spreadsheet would appear magically on the refrigerator. We would look at our assignments for the following evening and prepare to varying degrees. Sometime after Chris became a bishop, the spreadsheets stopped appearing on the fridge. As time became more limited, our family home evenings became a lot more casual. 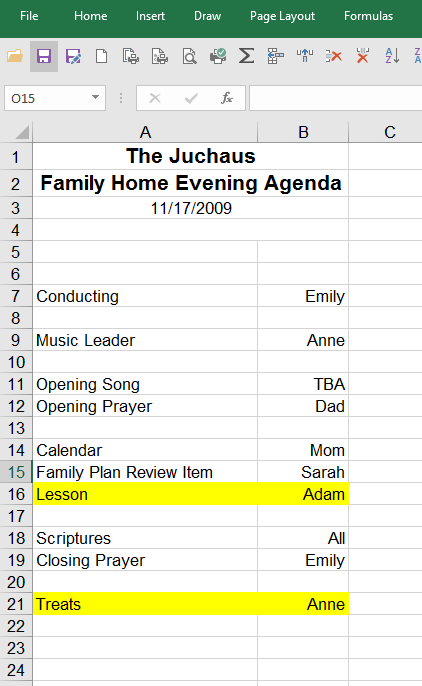 Now, many years later, with just Adam at home, our family home evenings consist of prayer, a calendar review, a short gospel discussion, and scripture reading. Sometimes we go to a movie or we go bowling. Sometimes we go out for a treat. Family home evening, no matter how messy or imperfect, teaches our families that we try to follow the prophet. It teaches our families that we have a desire to share testimony and gospel principles with them—that we don’t just rely on the church to instruct us. It shows a commitment to Heavenly Father and His plan. Some of my most tender moments with my children have happened with a book open in front of us—whether it was snuggling with a toddler at bedtime or reading aloud all day the very first day a new Harry Potter book came out. We read to our children every day and our children read to us every day [when they were young]. Our kids received books as birthday and Christmas gifts. To those of you who can’t fit your children on your lap anymore, may I suggest setting an example for your older children of reading often and reading varied material. They will learn that you value learning and knowledge and education, all without one parental lecture! Please read the scriptures together as a family. When you do, you send the message that Heavenly Father and His word are a priority in your family. It doesn’t matter what you make for dinner or how well you make it. It does matter that you are spending time together talking and laughing and listening; that children are learning how to help with food preparation and clean-up. Which leads me to # 5. Every family handles work at home differently. Some parents ask their kids to make their beds and have a tidy room before they leave for school every day. Some parents have chore charts. Some parents pay their kids to do jobs and that’s how their kids earn spending money. I’m not sure that there is a right or wrong way to teach your children to work but I do think children should learn to work. They should have responsibilities that contribute to an organized and (at least, relatively) tidy house and yard. The fundamental reason we’ve had a garden the past sixteen years is to give our kids a job in the summer—we certainly never had any intention of harvesting or actually eating what we grew! There is nothing better than waking up on an early summer morning and looking out of your back window to see your child squatting over the vegetables, weeding before it gets too hot. Now, to be honest, that only happened a few times over the past sixteen years, but it did happen! Teaching kids to work is difficult. It takes a lot of consistency and a lot of effort. I’m not suggesting our kids be our slaves and that we make their lives a drudgery, but I am suggesting that unless you were born a Kardashian, you need to learn to work. You need to learn to start and finish something, even if it’s not fun. You need to learn to clean up after yourself. You need to learn to contribute to a household. Sometimes we think we can do a job better and more quickly than our kids so we just do it ourselves. I have been and still am guilty of this. Make sure you work with your children so you can show them how to get things done. How will this activity benefit my child? Will it benefit our family? Why do I want my child to participate in this activity? Is it something I wish I’d gotten to do as a kid, but didn’t? Am I trying to keep up with what my neighbors are doing? If I’m completely honest, is my pride dictating this choice? Will this extra activity cause stress in our home? Are we already too busy for one more thing? And maybe the most important questions: Who do I want my child to be and will this activity help him or her become that? Picking and choosing activities would be a worthwhile discussion in a family council. Be deliberate and careful in your choices and plan well so you have the time and energy to be a family! Please understand that I’m not against every sports team and music lesson and dance class. The Juchau children were involved in all of those (and more) worthwhile activities. Our kids need lots of opportunities to learn and grow outside of the home. I hope, though, that we can be excellent at “intentional parenting” as Elder Nelson has encouraged, and not just let our kids’ activities run our family lives. What divine things matter most to your family? How can you pay attention to them? I’ve never been a big fan of the artist, Vincent Van Gogh, but a few years ago my daughter and I visited the Van Gogh museum in Amsterdam and I discovered something that made me appreciate him much more. In that beautiful museum, there is a room filled with Van Gogh’s art depicting houses and rooms and people at home. Apparently, he had a bit of a fascination with every day, ordinary home life. He liked to use the Dutch word, “menessesten,” translated into English as “people-nest.” He loved to think of, and paint, families cozy and safe in their homes the way birds find comfort and shelter in their nests. I, too, love that image. Home should be a place where our children find safety and refuge. I like to think of our homes filled with reading and gospel learning. I like to think of them filled with fun family dinners and a little quiet time. I like to think of our children learning how to work at home. I like to think of us being “intentional parents” and helping our children choose wisely the activities that take us away from home and each other. I pray that this school year and always, we will find ways to make our homes holy. In the name of Jesus Christ, amen.